In honor of National Daiquiri Day, I wanted to share a food-related newsletter. “Hungry Girl” is an amazing newsletter that shares a the healthy version of recipes we all love! The founder of this business really shows you that you can eat good and still stay healthy. I love it! 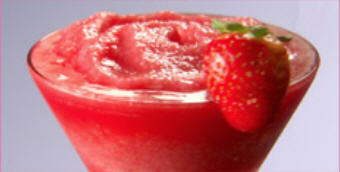 So, try this Slammin’ Slimmed-Down Strawberry Daiquiri recipe from her site. It only has 121 calories per serving! And sign up for the newsletter too, so you’ll receive lots of healthy-food ideas. Combine drink mix with 4 oz. cold water in a glass. Stir to dissolve. Transfer to a blender. Add all other ingredients to the blender, and blend at high speed until slushy and uniform. Pour into a glass and add a straw. Slurp that baby up! And that’s life in a nutshell … enjoying a delicious yet healthy daiquiri on National Daiquiri Day is simply blissful.